Kamikawa sub-prefectural area has many big draw in its area and TENNINKYO area along Chubetsu river is one of the strongly-recommended course to visit. This waterfall is called SHIKISHIMA no Taki (waterfall) and its tagline is "Niagara waterfall in Hokkaido". 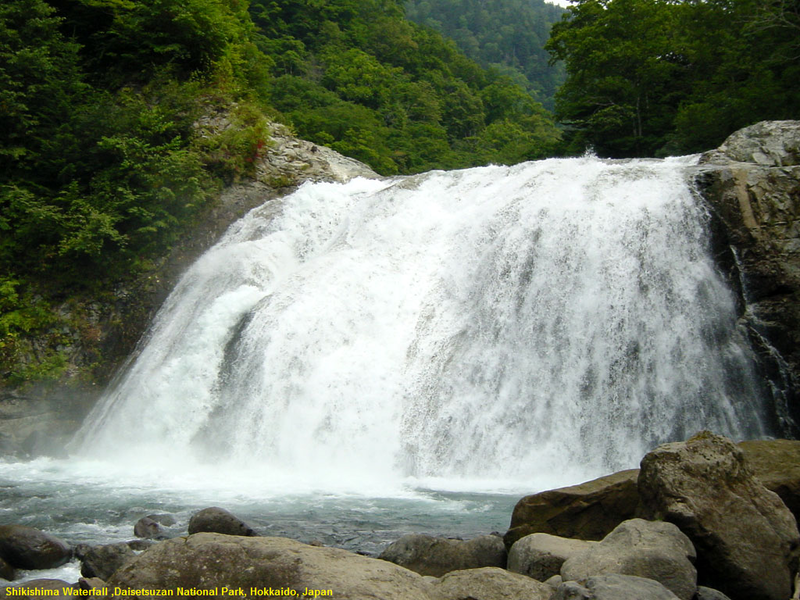 Approximately 40 minute walk from the hotspring hotel area in Tenninkyo brings you to this waterfall. In spite of the tagline, the size of the waterfall is much smaller than the real Niagara waterfall but please do not stick with the size. Just inhale the minus ion of water and feel the air of the garden of God in Hokkaido thai is called "Kamui Mintara" in the language of indigenous people in Hokkaido, Ainu. Chubestu river has gone berserk after heavy rain and winkle the bank of this river so many times. So before deciding to explore the waterfall, please get enough information because the access trail to the waterfall is sometimes hidden by the waterflow.